What a difference a year makes! If the biggest story of 2008 was how quickly markets had tumbled, this year’s biggest story is likely to be how quickly markets have bounced back. As we go to press, the TSX Composite is up 29.3% and the S&P 500* is up 13.6%. The MSCI EAFE Index that tracks other developed markets is up 8.5% but emerging markets turned out to be big winners this year gaining a stunning 45.3%. Bonds also had a positive year posting modest, but positive, gains of 5.2%. If 2008 marked a flight to safely, 2009 then marked a flight back to risky assets. And, it’s not just the stock markets. Home prices also trended up in most cities further boosting the net worth of most Canadian households. Last year, all that doom and gloom provided a silver lining — significantly cheaper asset prices. So, it only makes sense to note that the strong market recovery of this year is a mixed blessing. Yes, it makes us feel wealthier but investors in their asset allocation years would be wishing that equity markets had stayed low. (And on the other side of the coin, investors who discovered they took on too much risk will be happy to be handed a chance to rebalance their portfolio themselves instead of the market doing it for them). First-time home buyers rushing to take advantage of today’s record-low variable-rates are likely taking on too much debt because home prices are so high. Tax-Free Savings Accounts were also a big story this year. Though the initial contribution limit of $5,000 was too low to result in any meaningful tax savings for most people, the TFSA will turn out to be a significant savings tool in a short few years time. * — All index returns are reported in Canadian Dollars and exclude dividends. 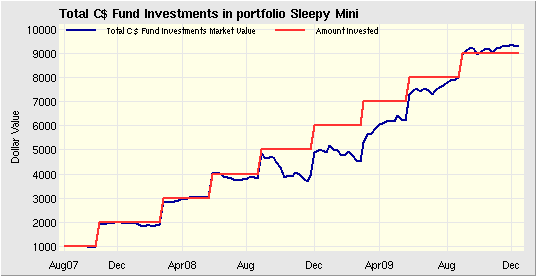 The Sleepy Mini Portfolio demonstrates the power of sticking to an investing strategy even when markets are crashing around us. And even though the markets have made a tremendous recovery, we should continue to stick to the investing program. In that spirit, we’ll once again add another $1,000 to the portfolio and rebalance it back to the target asset allocation — 20% bonds, 20% Canadian stocks, 30% US stocks and 30% International stocks. The rebalancing spreadsheet shows how to carve up the new money between the four TD e-Series funds. TDB900 – TD Canadian Index (e-Series) – Buy units for $145.99. TDB902 – TD US Index (e-Series) – Buy units for $278.86. TDB911 – TD International Index (e-Series) – Buy units for $354.81. Investing that does not fear the few basis points lost to the Harmonized Sales Tax!